In recent weeks, you may have seen the +1 button appear on Google’s search results. In the example below you can see the +1 button to the right of the search results. When signed into your Google account, if you did a search for ’email marketing wiltshire’ and saw in the search results either an organic search result or a paid ad for a company that you had used and rated then you would click the +1 button next to it. Let’s imagine you clicked the +1 button for Brand New Way, the company at the top of the organic search results. 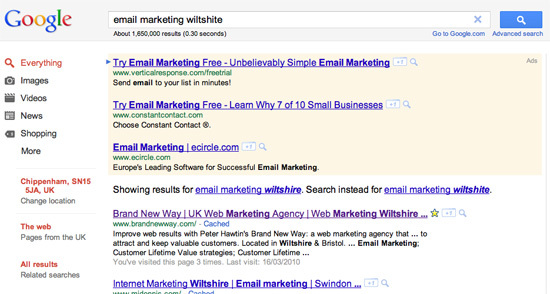 If one of your friends subsequently logged into their Google account and did a similar search for ’email marketing wiltshire’ they would see a personalised annotation that ‘Your name +1’d it’. This helps searchers see more personal, relevant search results and ads based on their friends’ recommendations. The business should gain by receiving more qualified traffic.